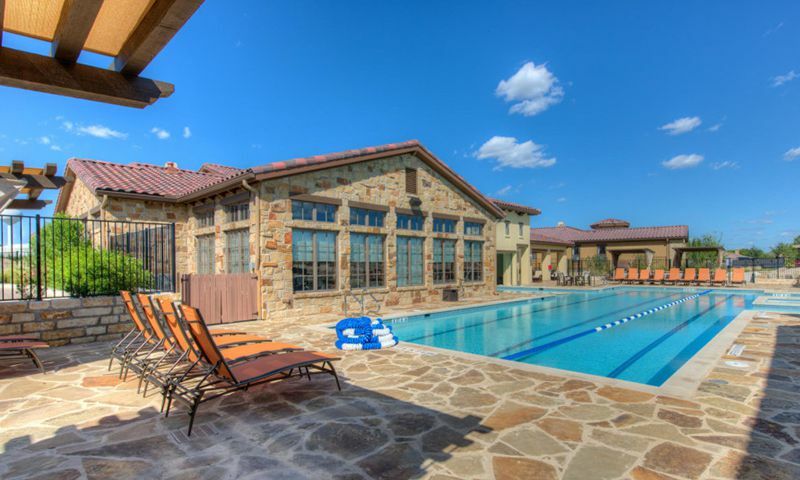 Located just an hour outside of Austin, Texas, Tuscan Village at Horseshoe Bay is a new 55+ active adult community being built by Legend Communities. Upon completion, it will consist of 304 single-family homes. With a clubhouse yet to be built, there are many planned amenities sure to excite all residents of this community. With a lifestyle director to make sure there are always clubs and activities, Tuscan Village at Horseshoe Bay will have something for everyone in this unique community, which is located on the Jack Nicklaus Signature Course, Summit Rock. The fun and excitement will begin at the proposed clubhouse in Tuscan Village at Horseshoe Bay. There, residents will find an exercise room for staying in shape and multi-purpose rooms for sitting with neighbors or playing a round of cards. Residents will be able to take dancing lessons or do yoga in the clubhouse's dance studio. Outdoors, there will be a swimming pool and patio for a relaxing swim or lounging poolside with a book. Pickleball and bocce ball courts allow residents to play exciting games with their neighbors. There will be a community garden and faux vineyard for those with green thumbs or just love to garden. Walking trails will be perfect for getting out for some fresh air. Legend Communities began construction on Tuscan Village at Horseshoe Bay in 2017. The plans for the community include space for 304 homes upon completion. While final plans have yet to be released, they have announced three separate model collections sure to attract any discerning 55+ active adult homebuyer. There will be townhomes, single-family villas, and single-family golf estates. The townhomes will range from 1,294 to 1,790 square feet in size. The single-family villas will comprise the majority of the community and range in size from 1,800 to 3,200 square feet. There will also be 13 single-family golf estates available with 3,600 to 4,400 square feet of space. All the homes in this community will include energy-efficient designs with high-end finishing touches like tile roofs, masonry, stone, and stucco exteriors. Being a resident at Tuscan Village at Horseshoe Bay means having more time to relax and enjoy life without having to do home maintenance or chores like mowing the lawn. A full-time, on-site activities director will ensure there are always many social activities and events for you to attend year-round. Coordinated programs like dancing lessons, arts and crafts nights, group exercise, and yoga will be just some of the exciting things you’ll be able to participate in every day at Tuscan Village at Horseshoe Bay. Residents of Tuscan Village at Horseshoe Bay will especially enjoy living right in the middle of a Jack Nicklaus Signature Course, Summit Rock. Proximity to Highways 71 and 281 make getting around the surrounding area easy. H-E-B Grocery, Home Depot, and Walgreens can all be found just a 15-minute drive away, meaning you’ll be near to daily conveniences and needs. If you’re interested in big-city excitement, Austin is only an hour drive from Tuscan Village at Horseshoe Bay. Baylor Scott & White Medical Center - Marble Falls is less than ten minutes away from the community. When traveling farther is needed, Austin-Bergstrom International Airport can be reached in an hour. Close to everything one would need in their day-to-day lives but nestled away in a serene golf course setting, Tuscan Village at Horseshoe Bay is ideally located near entertainment, shopping, and necessities in the Austin-Georgetown Area. There are plenty of activities available in Tuscan Village at Horseshoe Bay. Here is a sample of some of the clubs, activities and classes offered here. 55places.com is not affiliated with the developer(s) or homeowners association of Tuscan Village at Horseshoe Bay. The information you submit is distributed to a 55places.com Partner Agent, who is a licensed real estate agent. The information regarding Tuscan Village at Horseshoe Bay has not been verified or approved by the developer or homeowners association. Please verify all information prior to purchasing. 55places.com is not responsible for any errors regarding the information displayed on this website.